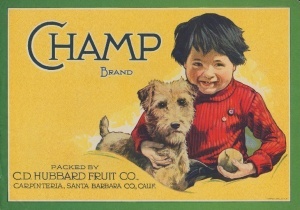 The Champ Brand @ 1920, is very likely an artist’s rendition of Packinghouse owner Clark Durand (C. D.) Hubbard’s son, Lester, taken from a photograph @ 1902. The image is one of those quintessential ones that has it all – a happy child holding a ball and a dog, beautifully illustrated. It is an ultra rare label out of Carpinteria, California, the most highly sought label from this city by collectors. During the 1920s, when the label was first used, Lester was a young man of about 20 years of age and definitely symbolic of the roaring 20s lifestyle. He is described by family and all those who knew him as one who loved fast cars, booze and women, one who sowed wild oats and ran with the Hollywood crowd. He was no longer the cherubic looking child on the label. In the years before his death, he had taken up the 1960s hippie lifestyle, wearing his hair long with a straggly, grey beard. He ran with the crowd of that younger generation, driving a convertible red Volkswagon Beetle and invariably without a shirt. It is ironic that the enduring image of Lester will be that of the smiling little boy with his dog and toy ball.